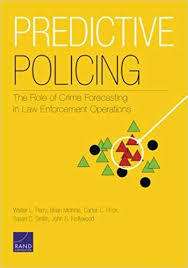 Predictive Policing research papers discuss how predictive policing is used to predict crimes before they occur. Many researchers have come to the conclusion that some crimes can be predicted, just like earthquakes. This relatively new concept is called predictive policing, and is far more than the science fiction scenario played out in the film Minority Report. Predictive policing began in 2008, when the Chief of the Los Angeles Police Department began working with the heads of the Bureau of Justice Assistance and the National Institute of Justice to explore the possibility of predictive policing. By 2010, researchers were convinced that predictive policing was a possibility, and Time magazine named it one the fifty best inventions of 2011. Predictive policing has been adopted by law enforcement agencies in California, Washington, Arizona, Tennessee, Illinois, and South Carolina. In Santa Cruz, California, predictive policing resulted in a nineteen percent drop in burglaries over a six-month period. Predictive policing combines a two-prong approach: applying advanced information analysis to data and creating intervention models. Predictive policing uses computer software to anticipate likely crimes in certain areas, helping to reduce incidents of crime. The FBI believes that by using computer-based predictive policing, many police departments can be more effective in an age of budgetary cutbacks. Algorithms based on complex mathematics, such as those used to predict earthquake aftershocks, determine patterns used by police departments. Paper Masters writes custom research papers on Predictive Policing and discuss how predictive policing is used to predict crimes before they occur.